AMD revealed its Fusion processor plans at a presentation at this year's International Solid State Circuits Conference (ISSCC). One of the things the company announced is that the Llano APU will be available from OEMs in 2011, this processor will be made on a 32nm SOI process, it will have four cores and on-die integrated graphics with DirectX 11 support. AMD expects Llano to run at clockspeeds of over 3GHz, and is working on new power management technologies to improve efficiency. Today we learn a bit more about the CPU side of Llano. 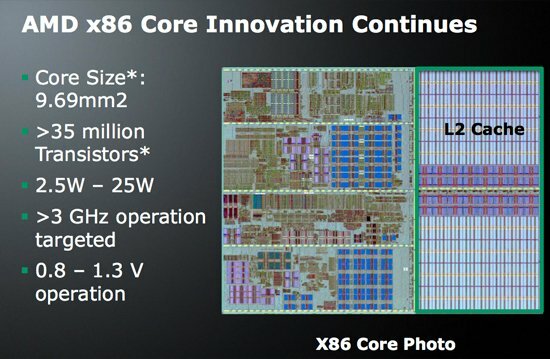 The first chip will be a quad-core processor plus on-die graphics. Each core is Phenom II derived, but there’s no shared L3 cache. So Llano cores look a lot like Athlon II cores. I’m hearing that they may have some architectural tweaks, so performance could be better than present-day Athlon IIs. At 32nm each core (minus L2 cache) is only 9.69 mm^2 and is made up of over 35M transistors. Each core is paired with its own 1MB L2 cache, meaning the quad-core processor will have a total of 4MB of L2 on-die. AMD expects Llano to run at above 3GHz, which should be more than possible at 32nm given that we’re already at close to 3GHz with the 45nm Athlon II X4. Full details about Llano can be found at AnandTech.